We wrote a few months ago about Paul, “YosemiteBear” Vazquez (the Double Rainbow Guy) as we stayed in his home in the mountains last year. It was an amazing experience and has been a formative part of our travels. I talked to Bear recently and he’s got a lot going on: not only is he running for President, but he’s also trying to get a ride to Burning Man. 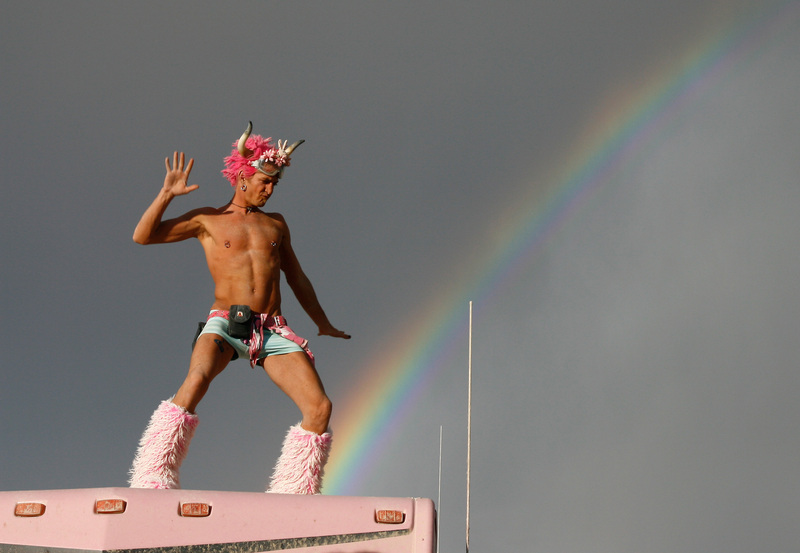 Ok, before you read on, it might be good to get caught up on what Burning Man is. According to the official Burning Man website, it’s an event held once a year in Nevada’s Black Rock Desert where tens of thousands of people create a city dedicated to community, art, self-expression and self-reliance. It’s been going on since 1986 and growing steadily since then, reaching 50,000+ participants! In fact, it’s been growing so fast that tickets have sold out this year for the first time ever. Whoa! Bear is feeling called to attend Burning Man – he’s been told by many over the years that he’d fit right in with the community. And last year, his daughter went and there was actually a Double Rainbow in the desert! People were singing his double rainbow song! Bear has decided to put a call out to the Universe and see if it was meant to be. He doesn’t have a ticket, a ride, or a camp, but with some help, he might be able to pull it together! Bear stumbled upon BurningManRides.com, a nifty site made by a few friends which matches drivers and passengers going to Burning Man and helps them share rides. He thought it was a great idea and reached out, asking for their help. He made a video to share with the world his interest in going to Burning Man and posted a ride on the site. If you know anyone who would be interested in helping Bear get to Burning Man by providing a ticket, a ride or a camp with electricity where he can stay – you can message him on BMR. Bear is a super awesome guy and totally deserves to be at Burning Man – share this message and help him get to the playa!